Norman, Willie and Earl Phelps grew up in the town of South Norfolk (now part of the City of Chesapeake) in the 1910s. The talented brothers were a natural combo, with bass singer Norman playing bass and guitar; baritone Willie on guitar, drums and washboard; and Earl, the youngest, singing sweet tenor and playing fiddle and mandolin. The brothers made the rounds of local clubs and radio shows, where their beautiful harmony and playful style gained them a loyal following. In 1936 they tested their wings on the national circuit, traveling to New York City and then to Hollywood, where they appeared in 17 films released between 1937 and 1941 – including Painted Desert and Rawhide. But Virginia was home. The Phelps returned to South Norfolk in 1940, where they continued to write music, record and perform. Norman and Willie served their country in the US Army and US Navy, respectively, during World War II, while Earl was excused for medical reasons and kept the band going at home. After the war, the three bought the old Norfolk County Club, renaming it Fernwood Farms. The club boasted the largest dance floor on the East Coast, with plenty of room for fans to swing out. The brothers frequently opened for out-of-town acts at the Norfolk Arena and hosted the performers at Fernwood Farms after the show. Visitors included Ernest Tubbs, Hank Snow and, in 1954, a newcomer to Snow’s band – a young singer named Elvis Presley. The Phelps turned a portion of the club into a recording studio where they recorded not only their own group but other local groups as well. When Patsy Cline performed at Fernwood in the 1950s, she recorded several songs in the studio. 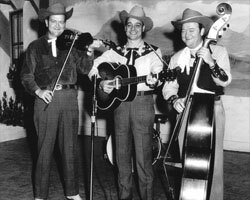 The weekly television show Norman Phelps and the Virginia Rounders was popular locally in the 1950s. Although the original Phelps Brothers have passed on, their music lives on through nearly a dozen CDs and in the work of a new generation of Phelps.